The Honda Indy Toronto is an annual three-day IndyCar Series race, held at the Exhibition Place. As Ontario’s largest annual sporting event and the IndyCar Series second largest running street race, the event attracts some of the world’s fastest racecar drivers and some of their greatest supporters. To celebrate the organizations 30 year anniversary, the event was led by the Canadian Armed Forces, who conducted a march along the track and an air show following the national anthem. For this year’s event, PNH Solutions was responsible for producing the visual branding for many of the sponsors of the event. In order to increase their brand visibility, both effectively and consistently, PNH Solutions offered close to 900 Trackside Decals and 600 Vinyl Banners, which matched each sponsor’s color palette, to cover the event’s 2.874 kilometer street circuit. Recognized for their durability, with fade-resistant vinyl and UV-resistant ink, the Trackside Decals and Vinyl Banners were suitable for an outdoor event that could have been subject to rain, wind or hail. 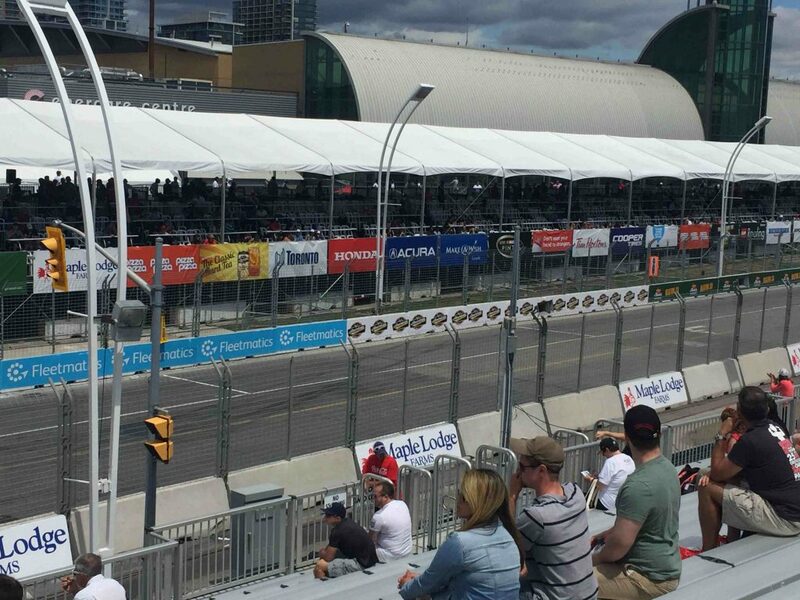 The Trackside Decals were a valuable product at the 2016 Honda Indy Toronto, as they helped the sponsors stand out at the event. Printed up to 144” W, they were installed on concrete blocks and tire barriers along the perimeter of the track. While they were visible to live spectators, they could have also been seen in televised footage or highly publicized pictures due to their close proximity to the course track. Made of pressure sensitive adhesive vinyl, the Trackside Decals were installed directly on the concrete, both quickly and easily. The Vinyl Banners were an equally important product at the 2016 Honda Indy Toronto. With Vinyl Banners spanning up to 576” W, the sponsors’ names and logos were easily recognized from different vantage points. With grommets installed all-around the banners, the Vinyl Banners were installed effortlessly along the bleachers, bridges and other structures. Without any risk of the banners tearing or flying away, with reinforced webbing, they were able to remain intact for the extent of the event. PNH Solutions was successfully able to contribute to sponsor’s brand visibility during the 2016 Honda Indy Toronto. With Trackside Decals and Vinyl Banners installed throughout the 2.874 kilometer race track, the sponsors were able to remain visible and gain brand recognition. Despite last minute requirements, PNH Solutions was able to prepare and install everything on-time and to the client’s complete satisfaction. Throughout the entire event, from the very beginning to the very end, PNH Solutions remained committed to delivering the best quality and service.